The journey of parenthood is a magical and maddening one so what better way to cope with it than through stand up comedy! Each week we’ll have 3 top circuit comedians, normally parents themselves oh and one token childless one to remind you, you’re doing ok, even if you have forgot to bring a gluten free rice cake. 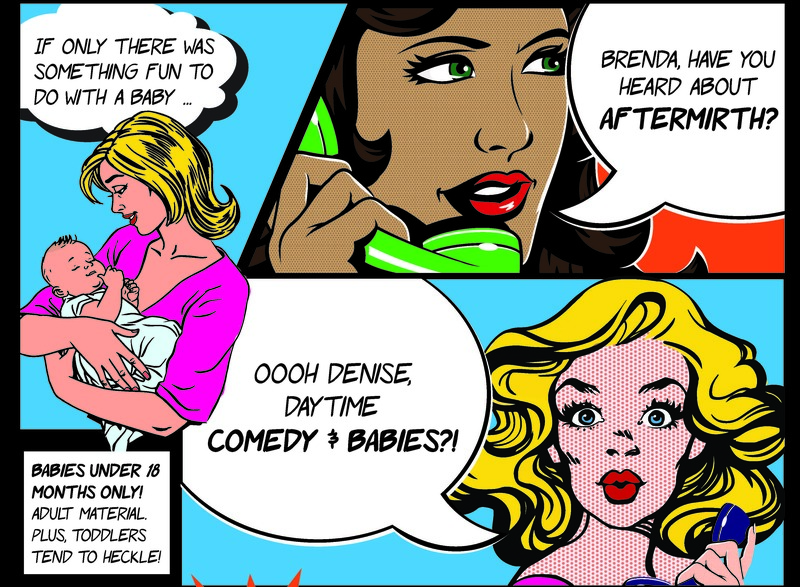 We’ll bring the toys, the food and the funnies, all you have to do is bring your baby, but beware, this is an adult comedy club, it will have mature content, sweary words and the odd birth story flash back. This special afternoon gig has toys, reduced amplification and a dimmed room so no one will notice those red eyes from sleepless nights. You’re encouraged to bottle, breast or Haribo feed, and we’ll have some wraps/salad boxes etc available from 12pm so you can actually eat yerself! You can walk about, or shake Mittens the Special Rabbit in order to soothe your offspring and no one will moan or mutter if your little one cries or screams. The gig is open to parents, Aunts, Uncles, Grans, carers, in fact anyone who needs some afternoon comedy and doesn’t mind some cute babies in attendance. Your April headliner in Noel Brodie, Noel is one of the busiest and most popular comics on the circuit who is in high demand in the UK and overseas. He is one of the few comedians in Britain who crosses over from comedy clubs to cruises, theatre and holiday resorts. The act is all Noel’s material and he spends most of his time coming up with new subjects to waffle about! PLEASE NOTE: We welcome babies under 18 months but are unable to accomodate children over 18 months. Please try not to bring your buggy as we have limited space, if you do bring a buggy it will need to be folded in the venue. Doors open 12pm for Mexican street food menu, cakes snacks and drinks, comedy starts 1pm and finishes at 2.30pm. We will have a selection of food on sale (please do not bring food bought outside the premises). There’ll be a full bar too, so go on, treat yerself to a Prosecco, you deserve it! Tickets £8 advance, £10 on the door (when available).